Just before Christmas, Rachel Aldred, Senior Travel Consultant at our Thorpe travel agents in Norwich, went on a festive search for Santa in Lapland. Here is what she got up to on her trip. This was very different from any other Easyjet flight I have been on. Is was a chartered flight for Santa’s Lapland so it was very festive and full of fun and games. The cabin crew have to apply to do these flights and are only allowed to do one a year. Normal in-flight service was given and then Santa’s Lapland supplied a drawing competition and a quiz to do. There were prizes given out for each and the crew also added other entertainment on top. They were great fun and had decorated the flight. Several unsuspecting adults were dressed up as snowmen by the children, whilst we played several games of bingo, sang Christmas songs and ate as many chocolates as we could manage. They really did enter into the Christmas spirit and everyone had great fun. We stayed in one of the largest log cabins, complete with its own sauna and sledges. The cabin was really spacious and with the added Christmas tree and decorations it had a lovely homely feel. Ours had 5 bedrooms which were simply furnished but very comfortable and all rooms had private facilities. The main living area had plenty of space, with a large open-plan living room and dining area making it perfect for a large family group. There was also a heated room to store your outdoor coats, suits and boots so they are lovely and warm when you go to put them on in the morning. As it was a catered cabin, there were delicious cakes waiting on both afternoons. The chalet staff came in from 8 till 8.30am to cook breakfast and then again in the evening to serve dinner at 7pm on the first night and 8pm on the second night. The Christmas cabins are dotted around the resort but are all within a short walk of the main area. On the way to our accommodation, we collected our thermal suits, boots, socks and gloves. This was really well organised and the equipment felt really clean and new. Day two was our search for Santa day. We were collected from our cabin in the morning and taken to the Arctic Circle Centre, which is a 25-minute drive through the pine forests, over a snow-covered road and really does feel quite remote. There were plenty of Christmas songs on the way to keep us occupied. Activities included in the day were: Snowmobile search for Santa and a private family meeting, husky sled ride, reindeer sleigh ride, snow and ice fun activities like ice hockey, tobogganing and the children can ride a snowmobile. The husky sled ride was amazing. I didn’t realise that we would actually get to ride the sleds ourselves but I’m so glad we did as it was a fantastic experience. The husky sled is the only thing that you are allocated a time for; everything else is available for you to do in your own time. On the snowmobile search for Santa, you go off in your own family groups to meet the man himself. The staff work very hard to keep the search for Santa element a secret from the children. Lunch is included on the search for Santa day. It was a two-course meal which was simple but very tasty. You can also help yourself to tea, coffee, warm berry juice and pancakes throughout the day. They are served in the main restaurant area and in the various tipis that are dotted around. I loved the tipis as they had lovely open log fires in the middle of them. At the end of the search for Santa Day, the guests staying in the hotel enjoy a gala dinner, whilst those in the Christmas cabins are treated to a Christmas dinner. This is a big evening for everyone, with lots of fun and games on offer. There were lots of elements that were great fun, but I think the husky ride stood out for me. 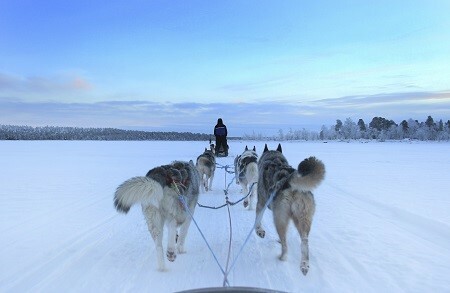 It is not every day that you get to lead your own team of husky dogs; it really was fabulous. The only slight thing was I thought the reindeer sleigh ride could have been a bit longer. That being said, the children on the trip had no complaints. The whole trip was very well organised and the staff were brilliant. I would definitely recommend this trip. I have often been asked by customers if its value for money and, having now been, I would say yes it is. 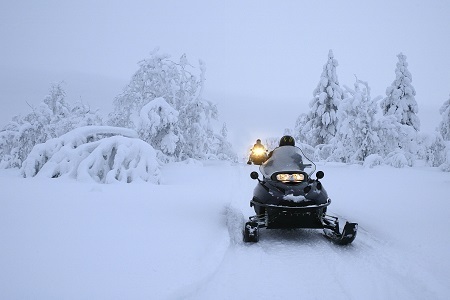 For anyone with children aged 4 to 10 years old, Santa’s Lapland would be a perfect and exciting trip. A lot of the staff take leave from their normal work to be involved in Santa’s Lapland, mainly for the entertainment industry. They all went above and beyond to be make sure that everyone had a really fun time. If you want to organise your own festive adventure for 2016, this would be the perfect option. Drop by one of our travel agents in Norfolk, Suffolk or on the south coast to speak to one of our helpful team.